Maximum Apocalypse is a cooperative roguelike adventure game for 2-6 players. In Maximum Apocalypse, civilization has already fallen. The players are survivors of the apocalypse whose mission is to survive the hostile landscape. The game map is randomly generated and different every time that you play. On each turn, a player can use up to four actions to explore the map, play cards, equip weapons, scavenge for resources, draw cards or battle off monsters. 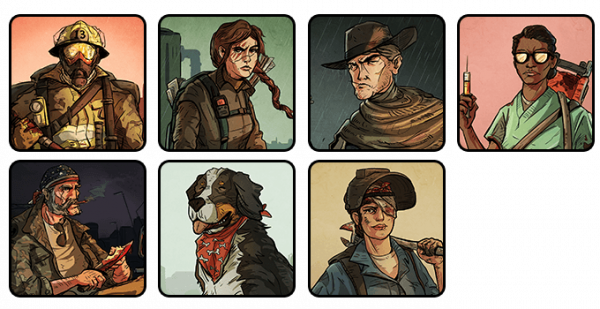 Picking a unique survivor class within the group, players must plan their strategy and work together while leaning on their survivor's strengths in order to defeat monsters and avoid starvation. For example, the Fireman is deadly up close with his ax and can easily chop down monsters; meanwhile the stealthy Hunter is great at scouting the map and avoiding traps — but roaming monsters are gathering quickly and time is running out. 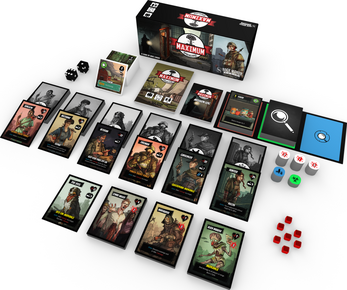 If you are overwhelmed by monsters or die of starvation, the players lose. If they can find enough gas and get it back to their van to escape, they all win and live to play another scenario. Zombie – Don't get overwhelmed by the Undead…luckily they're not too bright. Nuclear – Be prepared to give away your gear to nasty raiders before facing poisonous mutant rats. Alien – Race against the clock as the aliens force you to discard your deck as they work to assure the enslavement of humanity. 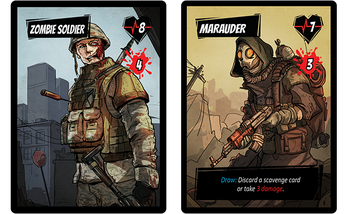 Each player selects a different Survivor with their own unique stats and deck of abilities and equipment. The Fireman is sturdy and strong and acts as the tank of the group. With his axe in hand, he is a massive short range damage dealer. The Hunter is stealthy and precise. She can scout the landscape for danger and is deadly with her bow and traps. The Gunslinger can deal midrange damage with his trusty revolvers as long as he has ammunition. The Surgeon supports the group by restoring health and boosting team performance with shots of adrenaline. The Veteran and his Dog are a team unto themselves. The Vet has plenty of old military gear and ammo and his dog has excellent instincts and is trained to attack if necessary. The Mechanic is a support class that can upgrade weapons, build defensive turrets or even call in a drone strike to clear a path forward. 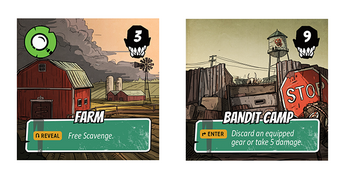 Every turn, Players take 4 actions to explore the randomized map, fight off monsters, play cards and scavenge for resources. There are two types of cards you can play on your turn: Instants and Gear. Instants are one shot cards that go you play for their effect and then they go in your discard pile. Gear is equipped and takes up slots but then gives you new actions that you can take. For example, the Scalpel can be equipped for 1 action taking up 1 slot of your inventory. 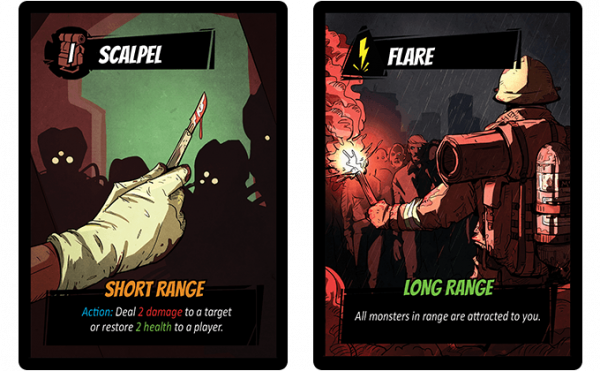 After it is equipped, you can now use the Scalpel to deal 2 damage to a target or restore 2 health to a fellow player. Meanwhile, the mighty Fireman can use the flare to attract all the monsters to him in order to chop them down with his trusty axe. As you explore the map, you'll come across new locations. Some of them are good and some can be very bad. I've spent almost 2 years developing the game system behind Maximum Apocalypse. It's built to be very moddable, offer a ton of variety and a lot of replayability. 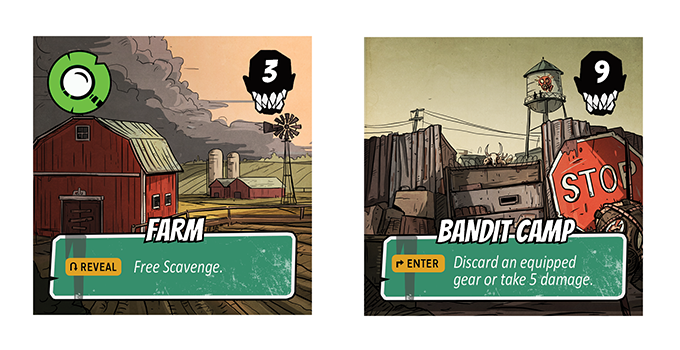 As part of setup, players will select a mission or scenario. Most missions deal with you finding a particular location, collecting enough fuel to escape and then making your way back to the van. For example, an early mission is to rescue a Scientist who may be able to cure the Zombie outbreak. In that scenario, the Scientist has barricaded themselves in the Police Station. Players will search for the police station, rescue the scientist and then bring her back to the van to escape. 9grid scavenge.pdf have no back side ? 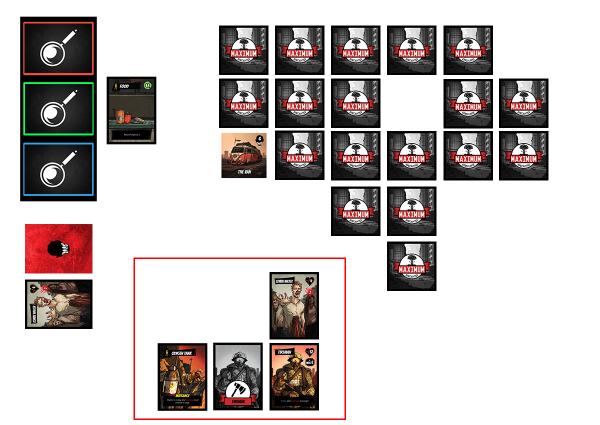 I'm not seeing the Scientist or Army Ranger survivor decks in the 9grid PNP or the MA Final Production Files zips. Are they in there somewhere (if so, what is the filepath inside the zip), or are they missing (if so, is it possible to get them somewhere else)? Thanks! Did they already gave you an answer? Nope, I haven't seen a response on that.